Just about every kid wants to make their own video game. And Bloxels makes it possible! 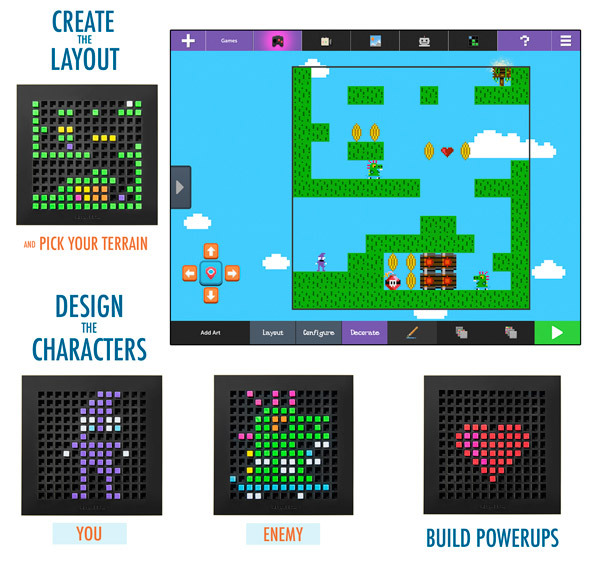 Using the colorful blocks and game grid, design a pixelated character to star in your game. Snap a picture with your smart device, and import it into the free app to develop the game further. Create environments and rules using a seamless collaboration between the physical pixel grid and the app. When you’re ready, play your own game, and even publish it to share it with the world! 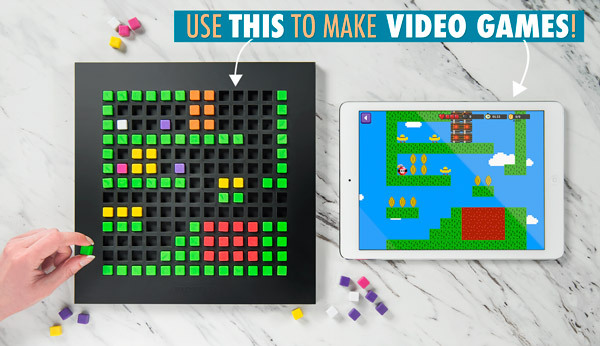 Bloxels helps you create video games without writing a single line of code. Add blocks to the game grid to represent a video game element such as a character. Then take a picture of the grid to instantly import your character into the app. With a few taps, you can play as that character in an existing level or in a level you build yourself! Make video games out of blocks! Bloxels gives you control over nearly every element of your game’s appearance. Use the 13 x 13 game board to create characters, alternate poses for their animations, power ups to change their behavior, coins to collect, and more. You can even design the appearance of the ground and walls! Then think a little more abstractly and design the layout of your levels. Each color of cube corresponds to a material type, so if you want to create a floating platform, drop in some green blocks. Or add a pool of water by placing a few blue blocks as an obstacle. Then go back to skinning your game and make the water hazard look like a toxic waste soup or a pit of lava. With Bloxels, you’ve got ultimate control over the game. Picture this: you make something in the real world and turn it into a video game element in an instant. 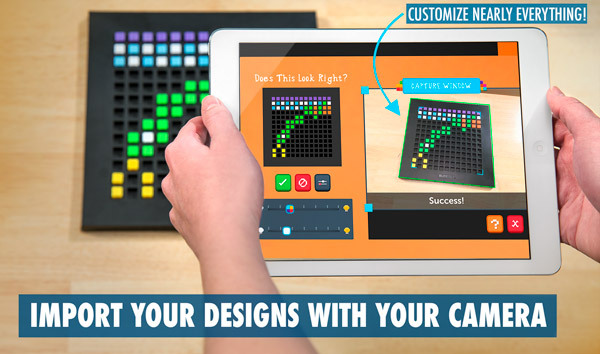 It couldn’t be easier with Bloxels Builder. Just load the app, take a photo, and voila! Your game grid mosaic becomes a part of your own video game. Once digitized, you can make adjustments and animate elements. A picture is worth 1,000 lines of code. Making your video game is so fun, it’s easy to forget that you can play it when you’re done! Each platform adventure you create is based on an 8-bit style that involves traversing terrain, collecting coins, and picking up powerups—all on the free app that you use to digitize your game. So what are you waiting for? Get building and get playing! Rated E because everyone can make and play! Jon and Joey, members of the Vat19 video team, take a first look at this amazing product. Jon and Joey take a first look at Bloxels. 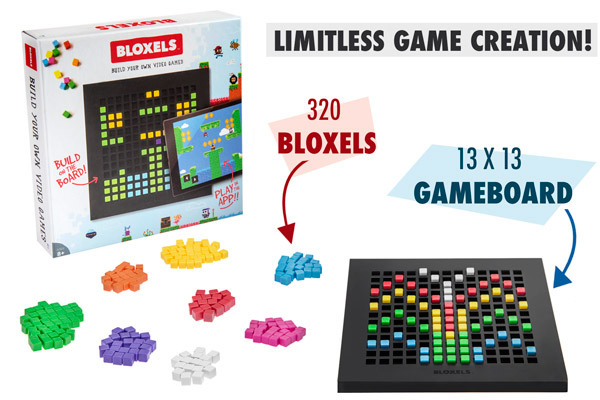 The Bloxels box includes a game grid and 320 colorful blocks. When you combine these tools, your imagination, and the free app on the smart device you already own, you unlock a powerful game creation tool. Question: Is the app free? Answer: Yes, a free app is available for iOS, Android, and Kindle. 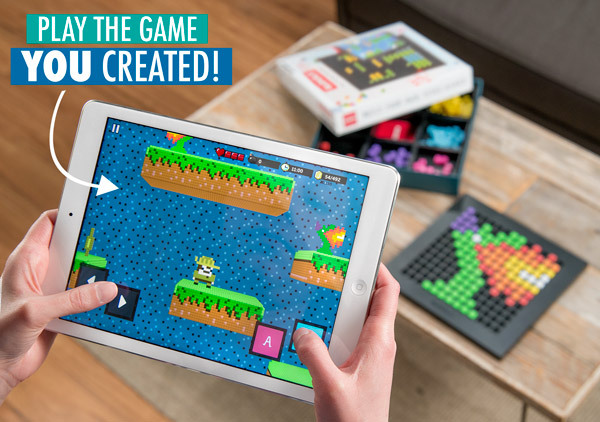 This Bloxels kit gives you the opportunity to build your video game with a unique hands-on experience. Question: How good is the camera capture function? Answer: When the lighting in the room is bright enough and your game board is on a solid-colored table, capturing a grid almost always works perfectly with a modern smart device’s high resolution camera. The capture screen in the app gives helpful tips to make capturing a game board as easy as possible. Question: Does it only make platform games? Answer: The current version of Bloxels helps you create platform games in the style of Super Mario Bros. Future versions might support additional game types.